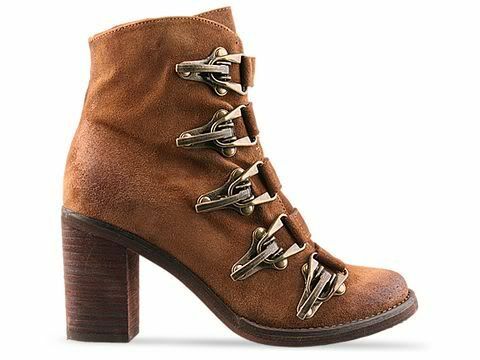 I better write about my new 2010 boots before it turns into sandal weather. I'm always drawn to accessories with buckles and clips and hardware and a lot going on. Well, check out the hardware on these shoes. Intense, huh? I saw this image and that was it. I thought they were fun and tough and whimsical, all rolled into one four-inch heeled package. And surprisingly easy to walk in. There was the one day, however, when I was walking briskly in my boots to the bus stop and I realized something was dragging from my shoe. 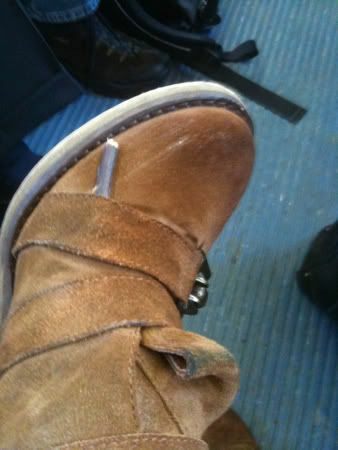 Somehow, impossibly, a tree branch had lodged itself into one of the buckles on my shoe. Posted in Style and tagged with Shoes. March 11, 2011 by Adele Chapin.